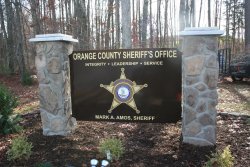 It is the mission of the Orange County Sheriff’s Office to provide excellent service and positive leadership to the citizens of Orange County, who, in partnership with us, will make the County of Orange a safer and more pleasant community where we live and work. We will impartially uphold the laws of the Commonwealth of Virginia, defend the Constitution of the United States of America, and contribute to the security of our nation. We will always uphold the honor of the badge, untarnished and undivided, with a firm commitment to discern between right and wrong and have the courage to do what is right. The daily conduct of our personal and professional lives will be the example for others, making a positive difference in our community by influencing people to do the right thing. We are servants of the citizens of Orange County, charged with a duty to protect the public, unconditionally provide assistance to citizens in need, and responsible for upholding the laws of the Commonwealth of Virginia and the United States of America.